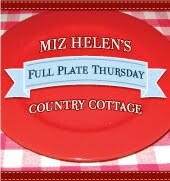 We are so busy this week getting ready for our Annual Picnic at The Cottage. We are expecting about 40 friends for a cook out and evening bon fire. We will have so much fun and lots of good food. I am so excited to see all of you today, just come on back to the garden, I want to take you on a quick tour of the garden, everything looks so pretty. Garden Tour Link, sure hope your enjoyed the tour, now lets see what you brought to share today, I can almost taste it, it smells so good!! Thank you so much for sharing your wonderful recipes with us, I look forward to your visits, and hope you will come back soon! Thanks for featuring my baby back ribs! Awww, wow, thank you for featuring my shake! Thank you so much for the party! Register for Get Cultured! -- On line Fermentation Class – On Sale Now! Big Savings! Hi Miz Helen, I hope you're having a good week. We have had sooo much rain. Did you get any?? I think our drought is over. Miz Helen, I have shared French Baguettes and German Chocolate Cupcakes. Thank you for hosting! Thanks so much for featuring my Basil Vinegar from last week and thanks for hosting! Miz Helen thanks so much for hosting this fun blog carnival. i just love recipe exchanges and I love the down home feeling of your blog. Be blessed! Thanks so much for having me today and for hosting this delicious party! Enjoy your big picnic and garden-sounds like quite a fun time! I'm delighted that you featured my Tomato Vegetable Soup. Thanks Miz Helen! This week I'm sharing my Tangy Carrot-Apple Salad. Great recipes today! We linked up a wonderful chicken recipe. Delicious. Thank you for hosting Full Plate Thursday. I've posted about a special dinner party for friends with a spectacular flaming grand finale. Hope you have a wonderful weekend down there in Texas. Hello Miz Helen, sharing a delicious buttery cheese spread. Thanks for hosting. Sounds like quite a shindig your having... enjoy and thanks for hosting. Hello Miz Helen, I joined in this week with the pickle pots I made. Thank You for such a great recipe and the rekindled memory of my Maw Maw. Thanks for hosting! I took the garden tour and I am so jealous of your long growing season. Love that awesome door! Thanks for hosting once again, Miz Helen! Have a fantastic day!! Thank you for hosting! I've linked up Brownie Pie this week. I'm sharing a delicious French treat: Roasted Bone Marrow w/ Parsley Coulis, the perfect appetizer: Spring Pea and Avocado Crostinis, and an Easy Breezy Trick To Make Polenta That You'd Never Believe Would Work. Thanks for hosting, Miz Helen! I dropped off some Guacamole Salad and Blue Moon Burgers, which would be perfect for your cookout! Enjoy! Thanks for hosting Miz Helen! Had a few issues with the link up tool, but it looks like it worked, yay! 1. i am enjoying the season extravagantly… by eating as many seasonal spot prawns as possible. One way? My link up this week: Fresh & Seasonal Spot Prawn Shellfish Pot. Yes. I ate all of it. and i’d do it again. 2. Bourbon soaked cherries. ‘Nuff said. Or the bourbon might start talking for me. Thanks for hosting, I look forward to perusing more of these recipes to fill out my menus for this week. I'm so jealous of your harvest since it still feels like winter going on spring in the Northwest. The strawberries are still a week or two away, but the rain is always refreshing and so many greens to choose from, I can't whine. Finn says Woof! Hello Miz Helen! Thank you for hosting! I shared my vanilla ice cream recipe today, ideal for those long hot days you have over there that we might experience occasionally too, if we're lucky! I just found your blog today and LOVE it. I love how you and your friends worked together. I plan on linking up each week from now on. Today I linked up my pizza sauce and crust recipe (Number 141 on your list)! We are so happy you gave the frittata a try and enjoyed it! Thanks for hosting. Have a great week! Thanks for hosting! I'm not sure why my link picture didn't work. If you want to delete it, I'll try again. Spinach Salad w/ Warm Bacon Dressing, can't go wrong with that:@) Happy Thursday! Hi Miz Helen. How are you this week? I'm loving all the recipes coming through. Even though it's winter here, I'm on a bit of a health kick and having lighter salads at night so am enjoying all the light fresh salad recipes. Thanks so much for hosting and enjoy your bonfire night! Thanks for hosting Miz Helen! Tis berry season and I'm sharing an easy tart you can make and wow your guests with... it was a big hit with my book club! Have a great weekend! Hi Miz Helen, I've brought some delicious Tortillas to share! Thank you for hosting, Miz Helen. This week's features look delicious. I particularly like the look of that chicken salad with berries. This week I've linked my Rhubarb Custard Ice Cream. Enjoy! I haven't posted in awhile but have missed your parties! Thanks for hosting, Miz Helen! Thank you for hosting Full Plate Thursday! This week I've linked my Blueberry Streusel Coffee Cake. Wish you and everyone here a lovely weekend!